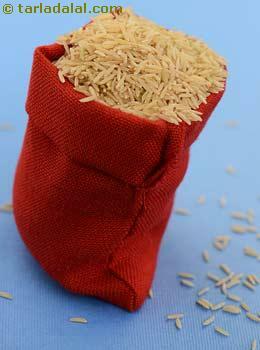 Brown rice is partly-milled or un-milled rice, in which only the outermost layer of a grain of rice (husk) is removed. Brown rice is a natural, unbleached grain, and thus retains more nutrients. It has a mild nutty flavor and a brownish color even after cooking. The glycemic index of raw brown rice is 55 which is on the edge of the low GI range. Compared to white rice which is refined, brown is a better option to have. However, brown rice is not widely used by people because it takes longer time to cook. Also the flavor is not as satisfying as the white rice. Is Brown Rice safe for diabetics? The glycemic load of raw brown rice is 12.5 which falls under medium GL category. This means Brown Rice is not highly recommended for diabetics. Carbohydrates is the richest source of energy. Brown rice contains 23 grams of carbs in 30 grams and since it has medium GL which depends on the amount of carbohydrates in 1 serving size, the portion size should be controlled. Otherwise your blood sugar levels may go haywire. It is surely better than white rice which has high GI but should be chosen cautiously to satisfy your craving occasionally. However brown rice is better than white rice because it contains additional fiber and other nutrients. Is Brown Rice suitable for weight loss? Because brown rice has more fiber and other nutrients compared to white rice which is refined, it becomes heavy even when you have a small portion size of it. Thus gives you a feeling of fullness in less quantity. Eventually your calorie intake will be lesser. To make it more nutritious and fiber rich, add lots of vegetables into it. Choose your portion size wisely and have your brown rice over white ones whenever you really feel like having while on weight loss.